Boasting the tranquility of its countryside setting, Selbusjoen Hotel & Gjestegard features luxury accommodations situated on the banks of Selbu, Norway. Built in the mid-19th century, before it was converted into the charming hotel that stands today, the property was occupied by a diverse collection of organizations and businesses, including a general store, hospital, post office, and a home for the elderly. 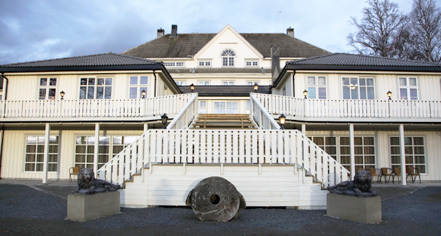 Operated by gracious hosts, Toril and Arild Øien, Selbusjoen Hotel & Gjestegard welcomed its first guests in 1988. The beautiful property affords 58 spacious accommodations, six well-equipped meeting and event rooms, and access to a variety of recreational activities allowing guests to relish in the enchanting natural scenery that surrounds it. 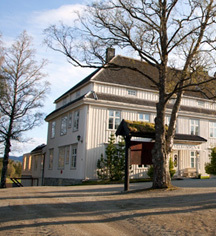 Selbusjoen Hotel & Gjestegard, a charter member of Historic Hotels Worldwide since 2013, dates back to 1850. The original property operated for decades as a general store, bakery, and post office. Cancellation Policy: Cancellations must be made 48 hours prior to arrival to avoid fist night’s charge. Cribs and Pack-in-Plays: Available upon request; NOK 100 per night. Extra Person Fees: NOK 295 per night. Payment: All forms of payment are accepted. Payment is required at time of booking. Visa, MasterCard, and Diners Club International are accepted. Rollaways: Available upon request; NOK 340 per day. Boasting the tranquility of its countryside setting, Selbusjoen Hotel & Gjestegard features luxury accommodations situated on the banks of Selbu, Norway. Learn more about the History of Selbusjoen Hotel & Gjestegard .